He was born on the 5th of May, 1966 in Shaki city. He went to school in Shaki city in 1973. But his father had to change his job and the family moved to Baku city in 1977. After finishing school # 56 in Khatai district of Baki city in 1983, he was called for military service. He entered Saratov High School of Commanders in 1987. When he finished the Institution in 1991, he decided to return back to his home country. By that time, Armenian terrorists had already started attacking Azerbaijani lands and a lot of heavy and bloody battles were going on in Garabagh and bordering regions. In order to protect the country from the enemy invasion Elshad applied for Ministry of Internal Affairs and was appointed as a platoon commander within the Internal Troops. E. Yahyayev was indeed a great commander and he served his country well in all the battles that took place in Sirkhavand, Nakhchivanik, Papravand villages. His Platoon received an order to release Nakhchivanik village from the enemy invasion. But when they were getting ready for the operation, they received news that the enemy surrounded dozens of our soldiers. The platoon counterattacked immediately and the enemy was forced o retreat with severe loss. But unfortunately the sniper bullet put an end to the life of the brave commander. Yahyayev Elshad heroically died on he 20th of June, 1992. 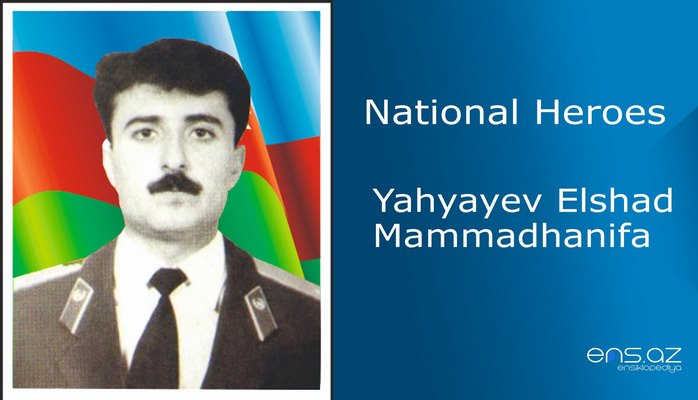 Yahyayev Elshad Mammadhanifa was posthumously awarded the title of the “National Hero of Azerbaijan” by the decree # 264 of the president of the republic of Azerbaijan on the 8th of October, 1992. He was buried in the Alley of Martyrs in Baki city. School # 12 in Shaki city is named after the hero. And there is also a bust of him in the school # 56 in Baki city.